More from Refuse to be Afraid, two more songs from Ten Thousand Days, and a small handful of other aural delights await if you'll click on the "pod" icon or click here. This week's chapter is "What this book is, and is not." This book does not contain a system, merely an exhortation. I believe that every human being is an individual, and it is dangerous to group individuals into a collective or make generalizations based on apparent similarities between individuals. We are snowflakes, not assembly-line products. No two snowflakes are alike, they say, and assembly lines were invented in order to churn out items that are identical in every possible way. Keep in mind, though, that even two products that come off an assembly line are not exactly alike. What works for me in overcoming fear may not work for you. To buy a hard copy or download the book, click here. And two songs from Ten Thousand Days this week, in part because "Cat Man" is a mere 61 seconds long. "All That's Left You (The Judy Garland Song)" also included. If you like that tune or think it's time to buy this whole groundbreaking album, click here. And vintage ads for Mountain Dew and K-TEL! Also, Sha Na Na exhorts listeners to not do drugs. All told, it's another lovely and entertaining podcast. Here's another chance to hear/download it: Click here. I have a caption for the picture of you and the dog in the post. 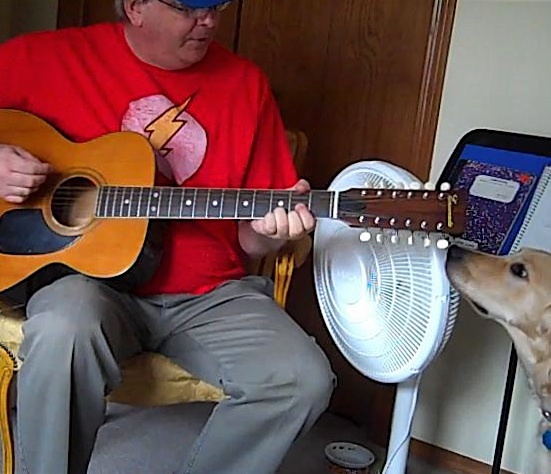 The pooch is looking at you thinking, "Dude, that guitar has 12 tuning pegs, but only 6 strings.